The global anti-fog lidding films market is evaluated and discussed by Transparency Market Research for the forecast period 2019 to 2027. The study stated that the demand for anti-fog lidding films generated due to rising consumption of fresh produce and dairy products is anticipated to prominently assist the global anti-fog lidding films market growth, estimated to be 1.6X of the current size, through 2027. In 2018, the global anti-fog lidding films market was valued at US$ 589.9 Mn and is expected to expand at a CAGR of 5.3% during the forecast period. Fog on lidding films tends to deteriorate their transparency which results in less visibility of the packaged product. Consumers perceive loss in visibility as declined quality which leads to shrinking sales. Anti-fog lidding films are used for various lidding applications so as to prevent fog formation. Anti-fog lidding films are segmented on the basis of material type, sealing type, applications and end-uses. In the global anti-fog lidding films market, peelable anti-fog lidding films are expected to dominate the market. Sub-segments of peelable segment include easy peel, medium peel, and weld/lock seals, among which, the easy peel segment is anticipated to register an impressive growth rate in the anti-fog lidding films market during 2019-2027. Consumers across the globe are increasingly concerned about hygiene when it comes to food and its packaging. An efficient method to achieve hygienic packaged food, which is free from micro-organisms and bacteria, is to enhance packaging solutions by incorporating specialty features in them. This has led to increased use of lidding films as they completely seal the product and prevent contamination. This, in turn, is expected to play a pivotal role in increasing the adoption of anti-fog lidding films in the packaging of fresh produce, meat, as well as dairy products. Food products which need to be transported to longer distances have to be appropriately packaged to maintain their freshness till they reach the point of consumption. Transportation may affect the appearance of the product due to temperature difference, which might affect the perceived quality of the product. Anti-fog lidding films which have temperature and UV stability, superior heat-resistance, and good tensile strength to survive the potential transportation damages are thus expected to have a positive outlook in the coming years. Independent studies have shown that consumers take very less time to shift to other brands if they face inconvenience in unpacking the product. This has created the need for a consumer-centric approach of packaging. The primary objective remains to design a product which provides not only ease of opening at the time of consumption, but also allows hassle free transportation. In order to achieve this, manufacturers are using lidding films with anti-fogging properties for their lidding applications. In the year 2017, KM Packaging Services Ltd., a European packaging manufacturer, launched KM Klarity+, a range of peelable anti-fog lidding films designed for lidding applications which deliver superior anti-fogging properties. By material type, the PP & PE segment of the anti-fog lidding films market cumulatively accounted for more than 60% in the year 2018. By sealing type, the peelable segment is anticipated to be the most rewarding segment in the global anti-fog lidding films market during the forecast period as trays are usually sealed using easy peel seals. Among the various applications of anti-fog lidding films, the trays segment is expected to represent an incremental opportunity of more than US$ 155.0 Mn during the forecast period. The fresh produce segment is expected to dominate the anti-fog lidding films market and expand 1.6X of its current value by 2027. 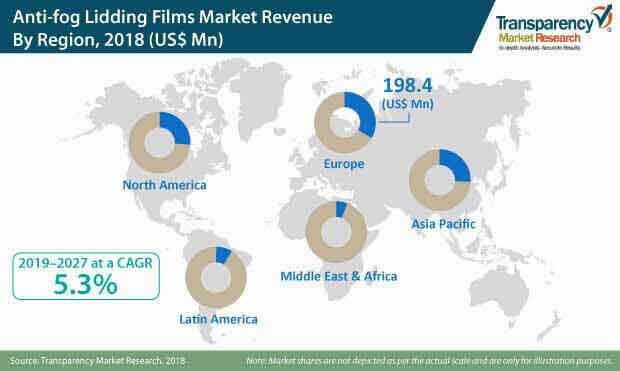 Geographically, the Asia Pacific region is expected to exhibit a positive outlook for the anti-fog lidding films market and is projected to grow at a healthy CAGR of 6.7% during 2019-2027. Key players in the global anti-fog lidding films market are Uflex Ltd., Toray Plastics (America), Inc., Plastopil Hazorea Company Ltd, Effegidi International S.p.A., Sealed Air Corp., Berry Global Inc., Flexopack SA. Winpak Ltd., Coveris Holdings SA, Flair Flexible Packaging Corporation, Rockwell Solutions Limited, RPC bpi group, Cosmo Films Ltd., Bemis Company Inc., ProAmpac LLC, Constantia Flexibles Group GmbH, Mondi Group Plc, Transcendia Inc., American Packaging Corporation, Hypac Packaging Pte Ltd., and LINPAC Packaging Limited. In this report, TMR offers forecast of the global anti-fog lidding films market between 2019 and 2027. The study reveals the market dynamics in five geographic segments along with a market analysis for the current anti-fog lidding films market environment and future scenario over the forecast period. The prime objective of this report is to offer insights and key market trends pertaining to the global anti-fog lidding films market that gradually help transform global businesses. The anti-fog lidding films market numbers have been assessed by carefully scrutinizing the production of anti-fog lidding films, in all the five key regions for the current year, as well as the historical performance of the anti-fog lidding films market. Market size and forecast for each segment in the anti-fog lidding films market have been provided in the context of regional markets. All the segmentation for anti-fog lidding films has been considered after appropriate secondary research and revalidation of the data obtained through interviews with key thought leaders in the industry. The anti-fog lidding films market has been forecast based on constant currency rates. A number of primary and secondary sources were consulted during the course of the study on the anti-fog lidding films market. Secondary sources for data on anti-fog lidding films trade include Factiva, various label associations, as well as company annual reports & publications. Detailed trade data has been provided to assess the global anti-fog lidding films market supply/demand scenario. The global anti-fog lidding films market report begins with an executive summary intended to give a clear perspective about the market to the reader. It is then followed by a thorough definition of anti-fog lidding films and the market segmentation describing the scope of the study. This is to outline the significance of anti-fog lidding films as a product, and the impact of their market growth on the industry. A Porter’s Analysis section ensures a thorough understanding of the level of competition in the anti-fog lidding films market. Porter’s Analysis for the global anti-fog lidding films market has been covered for bargaining power of suppliers and buyers, threat of substitutes and new entrants, and the intensity of competition. This is followed by market dynamics and an overview of the global anti-fog lidding films market, which includes TMR analysis of market drivers, restraints, trends, and opportunities that are affecting the growth of the anti-fog lidding films market. The material type considered in the anti-fog lidding films market study includes PET, PE, PP, and PA among others. PET is further sub-segmented into CPET and APET. Of these, the PP segment accounts for the major share of the global anti-fog lidding films market. On the basis of sealing type, the global anti-fog lidding films market has been segmented as peelable and resealable. The peelable segment in the global anti-fog lidding films market is expected to heavily dominate the market during the forecast period. Among the various applications, the global anti-fog lidding films market has been segmented into trays, cups & bowls and jars. Trays segment is expected to dominate the global anti-fog lidding films market. By end-use, the global anti-fog lidding films market has been segmented as Dairy Products, fresh produce, ready-to-eat, bakery & confectionery and frozen food. The next section of the report highlights the anti-fog lidding films market by region and provides the market outlook for 2019–2027. The report evaluates the present scenario and growth prospects of the regional anti-fog lidding films market for 2019–2027. The next section of the report highlights the anti-fog lidding films market by region and provides the market outlook for 2018–2027. The study investigates the regional year-on-year (Y-o-Y) growth of the anti-fog lidding films market. Key regions assessed in this report include North America, Latin America, Europe, Asia-Pacific, and the Middle East & Africa (MEA) region. The report evaluates the present scenario and growth prospects of the regional anti-fog lidding films market for 2019–2027. To ascertain the market size in terms of value and volume, the revenue generated by the key manufacturers of anti-fog lidding films and their respective production capacity is taken into consideration. The forecast presented here assesses the total revenue generated by value across the anti-fog lidding films market. In order to provide an accurate forecast, we started by sizing up the current market, which formed the basis of how the anti-fog lidding films market is expected to develop in the future. Given the characteristics of the market, we have triangulated the outcome on the basis of three different types of analysis, based on supply side, downstream industry demand for anti-fog lidding films, and the economic envelope. In addition, it is imperative to note that in an ever-fluctuating global economy, we not only conduct forecasts in terms of CAGR, but also analyse the market based on key parameters, such as Y-o-Y growth rates, to understand the predictability of the anti-fog lidding films market and identify the right opportunities for players. To understand the key growth segments in terms of growth and adoption of anti-fog lidding films globally, in the final section of the report, a ‘dashboard view’ of the companies is provided to compare the current industrial scenario and their contribution to the total anti-fog lidding films market. Moreover, it is primarily designed to provide clients with an objective and exhaustive list of manufacturers in the anti-fog lidding films market. Detailed comparative assessment of key providers specific to a segment in the anti-fog lidding films market is also included in the report. Report audiences can gain segment-specific manufacturer insights to identify and evaluate key competitors in the anti-fog lidding films market.